Have you thought about how much influence you really have as a leader? And how you can use your influence to get others to perform better? Many leaders and managers alike have a large potential for improvement here – much of what they do is without real consciousness of their ability to influence. By becoming more aware of this, not only do you develop yourself as a leader, but also enable your workforce to do even better themselves. Dr. Nashater Solheim is trained in negotiation skills and influence from Harvard Law School and has a doctoral degree in Psychology. 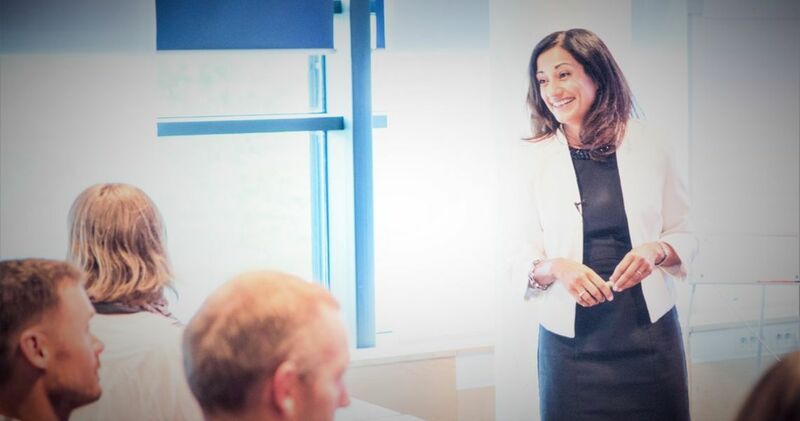 Through nearly 25 years as a Leader, Director, Neuropsychologist and Executive Coach she has been actively engaged with training the power of psychology to create a positive influence in businesses. She is particularly concerned with how you as the leader can have the influence you need to motivate staff and negotiate with other managers, stakeholders and even competitors. Solheim explains that leadership today is having to respond to rapidly changing demands with digitalization & Artificial Intelligence disrupting the traditional workplace and an upcoming generation of employees fueled by collaboration. – Going forward it will be even more important for leaders to demonstrate new types of influential leadership skills to help their organizations develop the creativity and innovation needed for successful transition. For that to happen successfully, leaders should be able to create results through positive means i.e. to persuade and influence others to follow in the direction that the leader needs to go. – They need to know how to get others to willingly deliver their best for the benefit of both parties and that’s really about “negotiation”. Getting this right will help in building trusting collaborative alliances– with their teams and peers, managers and stakeholders. Old fashioned management approaches relied on “telling” or “demanding” others to do what was needed. However extensive research has shown that a more skilled “influencing” style of leadership is key to motivating teams to give more, contribute proactively and in a more innovative way. This has proven to be a successful approach in many Fortune 100 companies’ competitive advantage. Solheim points out that finding a person’s motivation- what triggers it – is the core of effective influence as a leader. This is all about psychology, and it takes time to learn how to do it and be good at it. – Finding the other person`s motivation “hook” lies at the heart of leadership influence – that’s the psychological task. So learning how to do this and being good at it takes training. Success is based on the psychological principle that having insight isn’t enough to produce change in behaviour. In order to achieve a sustainable change or improvement whether at work, at home or in relationships, your behaviour has to change. Let’s take an everyday example – improving your fitness. You can’t simply “think” yourself fitter – you “know” what you to do but you must physically train to achieve it and if sustained over time, your attitude towards the need for fitness will change for the better. In everyday life we know that to change our attitude we need to change what we DO. – My unique psychological and cross-cultural business experience drives my approach – it stems from my integrated expertise as a neuropsychologist – working with brain injuries where I learned how to retrain the brain to learn new skills and behaviours and also as a forensic clinical psychologist where I learned investigation and persuasion techniques working with offenders. Having then worked as an executive leader in businesses here in Norway and in the UK, I realised how many of the skills I knew would be relevant to leaders in their work with influencing and motivating teams, dealing with conflicts, and trying to win over others to support their business cases or agendas. -From my own experience I know what it’s like to be a leader who faces these daily challenges, and with demands coming from all sides. In my view as a coach, it is therefore even more important to have a simple and pragmatic attitude to this -not coming with a lot of complex theories, power point slides, analyses of large data or lengthy reports that take days to read. Not only is this latter approach a waste of time and money for leaders, but it serves only to increase insight and knowledge, without a focus on how to change behavior. It is how the leader behaves in daily reality that determines how good the person is in motivating and influencing others. – I often get feedback from employees that even the best “leadership programs” leave leaders struggling when they get back to their offices and daily work. They have learnt what they must do but still fail in how to translate these ideas in to their own style– they don’t know which questions to use or when to use them, they can feel clumsy in phrasing what they mean, and sometimes end up saying or doing things that just make matters worse..
-From experience, I have seen that it is often better to keep it simple. The most important starting point for leaders is to “get out of their own heads.” Secondly, prepare well – take the time to really understand what drives the employee and what motivates them to work at their best. Thirdly, they need to learn the skills of what to say and how to behave to capture that motivation and make it work for the good of the employee, leaders and company – that’s the key. Solheim stresses that this way of thinking – and especially being prepared -is important also to have positive influence on other leaders, stakeholders and competitors. In these cases, it’s often about negotiation, and it is based on the same basic principles as having influence with employees. – The keys are in advanced skillful preparation for the case in hand whether that is for a meeting with a stakeholder, a commercial negotiation, presenting a business case, or learning from competitors. Get this right and this is 80% of your success already! -Secondly, it’s knowing how to choose the right questions, steer the agenda or dialogue, use purposeful body language, and tactical handling of the meeting all play a critical part in the success of positive collaborative influence. Research from some Fortune 100 companies shows that these types of skills can positively improve performance by as much as 20 percent. As the world becomes ever more connected and integrated in business, then these types of skills are essential for all managers and professionals when it comes to achieving influence and impact across cultures, disciplines and industries. C – Communication. What questions to ask and what you say to convince or persuade others and build positive trusting relationships. “The most important thing is that everything you do as a leader – in order to have positive influence or impact – is based on you doing the right things, not only that you know what they are” concludes Nashater Deu Solheim.